This winter, the ASTROLab will offer astronomy evenings every Saturdays from February 9th to March 30th. Enjoy a magical evening ! 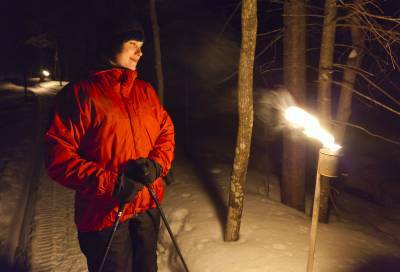 Every Saturday night, the package includes : a snowshooing hike in a trail lighted by torches, and an astronomy evening at the ASTROLab. Every Saturdays from February 9th to March 30st, plus March 6-7-8. 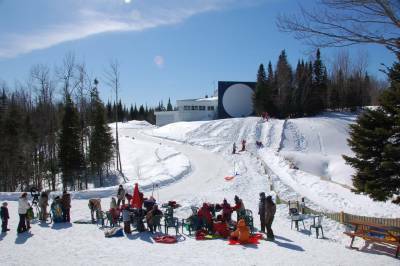 This winter, during the 1st week of March, at the Spring Break, the Parc National du Mont-Mégantic offers you activities FROM SNOW TO THE STARS ! Click here to find out our special programm ! On Thursday during the spring break, come enjoy our special programm for the whole family ! Every day, you can discover 43 km of snowshooing trails or 26 km of cross country skiing trails.